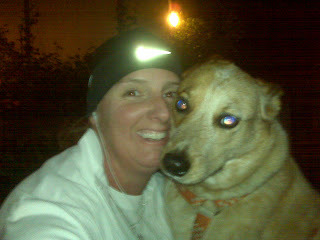 This is just a little tribute post to an awesome runner and her furry running companion. Penny (aka Southbay Girl) and Velcro contributed to my fundraising page for the Arthritis Foundation's 25th Annual Jingle Bell 5K...and I couldn't be more grateful! Seriously, it is so amazing to have such cool running/blogging buddies. Penny & Velcro, you both rock! Penny (and Velcro) is good people. Big karma points. Wow, Zoe...you really didn't have to do that! Thank you!